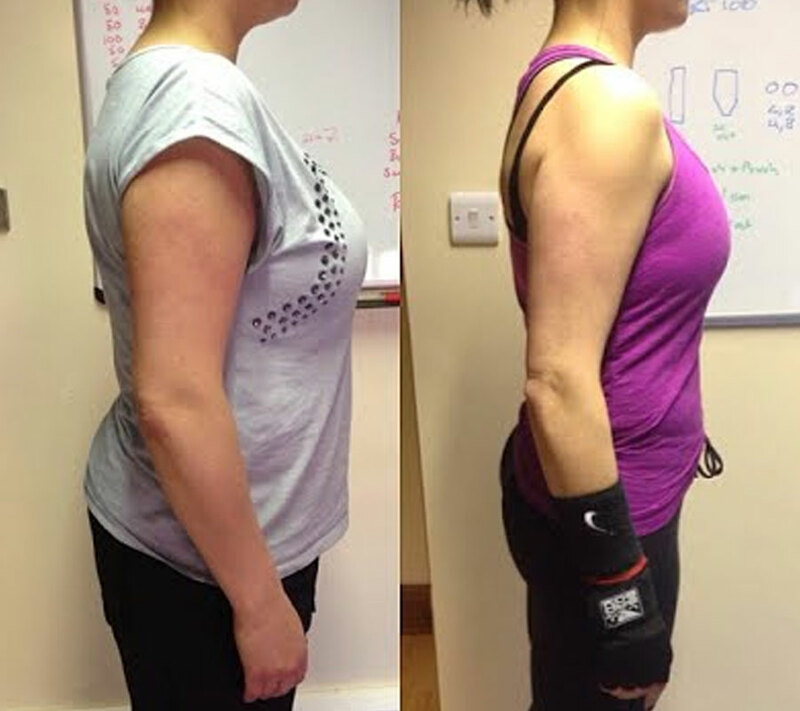 Lisa started with us in May 2013 and has gone through some mega changes. She looks great, is as strong as an ox and if you ever hold the pads you’ll understand how hard this girl can hit! She has made health and fitness her lifestyle and continues to better herself in all aspects of training. “In early 2013 I decided that I had had enough of the way I looked and felt and that it was time to do something about it. I had spent most of my twenties eating rubbish, drinking excessively every weekend and trying every fad diet, diet shake and diet pill going… now at 33 years old all of this abuse to my mind and body was starting to take its toll. I looked into several local gyms (all of which I’d tried before) but didn’t feel motivated or inspired to join any of them and so started to consider working with a PT basically to give me the kick up the arse I needed. I’d heard about Ross through some friends who attended his bootcamp and so gave him a call. Ross listened to me moaning and was very optimistic about the changes he could help me make. In hindsight my goal was simply to loose three stone and then to do as little as possible in the form of exercise to maintain that lower weight (NUMBER ON THE SCALE). I had the mindset that the number on the scale defined me as a person and weighing nearly 15 stone, my self esteem was very low. I had tried most types of exercise classes but had never found anything that I actually enjoyed or gave me the results I wanted. So in May 2013 I started to work with Ross. It was a rocky start as the second week in, Ross broke his ankle and a few weeks later I badly sprained mine and had to rest. However, that didn’t stop me and a couple of weeks later I was back on track. I was actually enjoying training and learning about nutrition and most importantly how to have a balanced lifestyle – I was still able to enjoy a glass of wine and a takeaway! I was eating more food than I ever had done on a ‘diet’, I was never hungry and I was genuinely surprised that I was losing weight (body fat % and the number on the scale was decreasing) whilst eating so much! I was learning how to make good choices with food and seeing results every week. My training was different every session with Ross and as part of this I learnt how to safely lift weights (something id never done before). I slowly got stronger and surprised myself with what I could lift! As well as my 1:1 sessions I did 1 kettlebell class every week 1 bootcamp session and then I found boxing and loved it! Ross progressively taught me lots of skills and techniques and this type of training quickly improved my stamina and fitness. By November 2013 I felt and looked like a different person but I had hit a plateau with my weight loss. Ross helped me tweak my diet and training program and I decided to switch things up a bit. I signed myself up to the warrior women program and for 6 weeks I was lifting heavy weights 3 times per week. It was hard work and I often dreaded the session but felt a great sense of achievement after I’d pushed myself to the limit with the support of Ross and the other girls on the course. By christmas I had achieved my original goal of losing three stone but my mind was in a new place and there was no way I was stopping there and I couldn’t contemplate not having the gym as a part of my lifestyle. I continued to train mostly with weights and kept up the boxing and the odd bootcamp/strength and conditioning class. At the start of 2014 Ross began to train me along with one of the girls doing more intensive boxing and MMA work. Sarah is a great partner and as well as helping each other to improve our technique we are both very competitive and enjoy sparring and grappling together with guidance from Ross. In July this year I also started training with Tom. When lifting heavy weights on my own I have always been a tad scared that I’m going to injure myself and so Tom is helping me perfect my form to ensure this wont happen. I’m already feeling much more confident and the adjustments Tom has helped me make are making a massive difference and having a positive impact on my training. Tom is very knowledgable and explains anything I want to know about lifting weights. He’s also helping me adapt to ‘flexible dieting’ – an approach which I could not begin to try and explain, but I like it! RT fitness is a great place to train..both Ross and Tom are super knowledgable and are always happy to help you achieve your goals. All of the members are lovely too and are on the same journey – always striving to be better! One of the biggest differences I think in this gym is that if you have a mad weekend or you eat a packet of biscuits all is not lost, all of your hard work is not lost…the people there help you get straight back on track and working towards your goals. You can’t spend your life training intensely and eating a boring selection of foods. Consistency with both diet and training is definitely the key but if you do slip up it’s not the end of the world you just get back on it! Ross has helped me realise that exercise and good eating habits are a way of life and I can’t see myself ever going back to my old ways!